As I learn more about God’s grace, something has become disturbing apparent to me about many of today’s churches. It seems that as Christians, we have too often forgotten all about our founder – Jesus! I know that sounds a bit crazy, but I want to present a challenge to you next Sunday when you go to church…this will tell you if you are in a church that truly preaches the gospel of Jesus, or you might possibly be hearing “another gospel”, as mentioned in Galatians 1:6-7. 1. Pay attention to what the sermon is about. When the pastor shares the topic of the message, does it point to you – or to Jesus? Is the message telling you to look into a mirror and check out your own reflection, or does it compel you to look at Him? Who is the star of that Sunday morning’s message – Jesus, or you? 2. Notice if you are given a laundry list of things you need to do in order to be pleasing to God, or to get more from God. If you end up with several bullet points to work on, then there is a chance that you may not hearing the true gospel. Paul wrote the book of Galatians to Romans who had recently become Christians. These Galatians believed in Jesus, and the truth of the gospel told them that they were saved by their faith in Him, not by their behavior or actions. 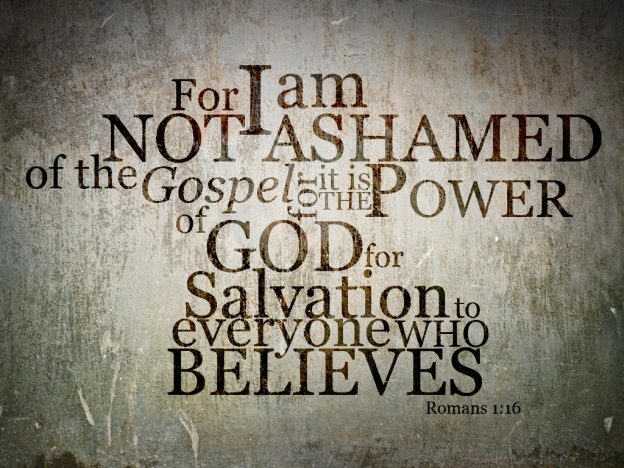 But just like many religious teachers today, certain Jews of that day were trying to infiltrate the purity of the gospel by telling these people that in order to be acceptable to God, they also had to add some actions and behaviors into their faith in Jesus. In a nutshell, the law causes you to focus on you, which will never make you righteous before God. The gospel causes you to focus on Jesus. Faith in Him makes completely acceptable and holy before the Father. Period. Think about it… God the Father sent His Son, Jesus, to sacrifice Himself so that we might be forgiven of all our sin and to give us the FREE gift of righteousness (Romans 5:17). THAT, my friend, is the gospel! The gospel is not supposed to be about how obedient we are to “following the rules”, or working to get brownie points from God. It’s not supposed to be about walking around pretending that we are better than others who don’t believe in Jesus. It’s not supposed to be about pointing out sin wherever we see it (that’s the Law’s job by the way, not ours). The gospel is supposed to be about Jesus (Mark 1:1)! 3. Here’s a simple one…count how many times Jesus’ name is mentioned during the message. If you hear the name of Jesus over and over again, there’s a good chance that you are learning more about Him. On the other hand, if you don’t hear His name mentioned much (maybe you hear a lot of references to “God” instead), chances are that you are going to leave that service feeling more weighed down than ever – carrying responsibility, guilt or an “I can do it!” attitude (which you won’t be able to do, by the way). The problem with this is that the gospel is not about what you need to do. It’s about what Jesus has already done! I’m not trying to point the figure at churches, nor would I ever accuse well-intending teachers and preachers of intentionally causing anyone harm. And far be it for me to think that I am more knowledgeable than others who have been teaching and preaching for years. All I know is this – I just want to hear more Jesus. He loves me, and He loves you. He has saved us from death and destruction and given us eternal life. How could we possibly go WRONG by talking more about Him? When in doubt, I’ll lean on the side of His grace. Just give me more Jesus, please. This entry was posted in Coaching on May 17, 2016 by kHHz9uqIE4UG.